Blachford Lake Lodge sits at the west end of Blachford Lake, a 17 km (12 mile) long jewel of a lake set in Precambrian rock in Yellowknife in the North Slave county in Canada. 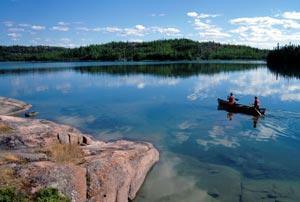 Blachford Lake Lodge offers you spectacular getaways in Canada's far North, in the North Slave county at Yellowknife. Blachford Lake Lodge offers accommodation for up to 35 guests in five rustic log cabins and five comfortable guest rooms in the Main Lodge. Spacious, "green" washrooms in the main Lodge offer privacy, hot showers, plenty of towels, and an innovative composting toilet system. Gourmet Northern meals are prepared by our talented Red Seal-certified chef. The Lodge includes an open dining area, bar and lounge. Services include a fully stocked bar, wireless Internet, and satellite radio. Our hot tub under the stars, and a sauna are located close by. The Lodge offers conference facilities for groups. There is a satellite telephone for emergencies. Come experience the northern lights playing directly over the Lodge in awesome multicoloured displays. You'll have an exclusive, front row seat for nature's own light show after dark. Blachford Lake Lodge is set on a remote jewel of a lake, just 20 minutes by charter aircraft from Yellowknife, capital of Canada's Northwest Territories. In late summer, the Aurora can often fill the night sky, reflecting off the shimmering waters of Blachford Lake. On crisp winter nights, the Aurora, the moon and the stars light your way on snow covered paths. There are no roads, there's no traffic, and though we have high-speed internet and satellite radio, at Blachford Lake Lodge the world and its cares seem a long way away. Our spacious, handcrafted log Lodge and log cabins offer a blend of rustic charm and modern comfort. Blachford's gourmet meals and fine wine list share rave reviews with our spectacular and unique displays of northern lights. Experience the northern lights playing directly over Blachford Lake Lodge on long winter nights. Enjoy an exclusive, front row seat for nature's own light show. Join the fun in the snow during the day ? dog sled rides, skiing, snowshoeing and skating are offered. Your flight to the Lodge is a romantic link with the past. Fly out from Yellowknife by ski-equipped Cessna or De Havilland Otter aircraft and land on our Blachford Lake ice runway. Your flight is an exciting part of the Blachford experience. Winter guests often see caribou or moose on snow covered lakes on their 20 to 30 minute flight. At Blachford, check into your comfortable room, and prepare for gourmet meals and plenty of winter activities to fill your days and nights. Try dog mushing, ice fishing, hockey or skating on our outdoor rink. Enjoy the sauna, or lounge under the stars in our hot tub! Snow Shoeing at Blachford Lake LodgeWe offer groomed trails near the Lodge, ideal for skiing or snowshoeing. And we have the skiis and snowshoes available right by the door. Just pick your size. Our staff will be pleased to assist you. You can travel further from the Lodge by dog team or snow machine to see the cliffs of the East Arm of Great Slave Lake. You'll be among the first to see this spectacular area, soon to be a National Park. Snowshoeing in the forests around Blachford Lake LodgeFor an authentic northern adventure, spend a night in a cozy, heated, prospector's tent with the northern lights overhead and your own dog team curled up nearby. Let our staff pamper you with terrific meals and the level of activity that suits you. We'll even outfit you with warm winter clothing, if necessary. 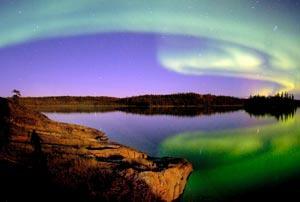 And each evening, if the weather obliges, you'll have an opportunity to marvel at the northern lights. Choose one of our viewing decks, the hot tub with the million dollar view, or the Aurora sized windows in the main Lodge. And if you should doze off, we offer an Aurorawatch service, to alert you when the northern lights are at their best. uxuriate in the long days of summer at Blachford Lake Lodge. This is the Land of the Midnight Sun. In June and July there are only a few hours of dusk each day. Blachford guests can enjoy round the clock activities. 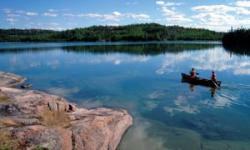 There's fishing, hiking, canoeing and kayaking, with guides, or on your own. On long summer days there's swimming too, in a solar-warmed northern lake. Summer or winter, the Lodge features gourmet meals and a licensed lounge. 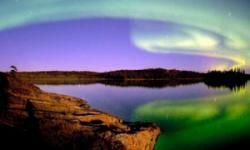 When summer turns to autumn in late August, Aurora watching joins the day's activities. Guests can pull up a front row seat for a spectacular show on one of our decks, beside an open fire or in the comfort of the Lodge. For a rare treat, recline in our hot tub with the million dollar view of the sky! Our summer temperatures average 10ºC to 30ºC ? perfect for hiking, swimming, or exploring the lake by canoe or sea kayak. The fishing's spectacular at Blachford Lake Lodge. Guests have landed 38-pound trout and 28-pound northern pike, to be promptly returned to the lake as part of our catch and release program. Smaller fry can be served up as the featured dish of a superb shore lunch.